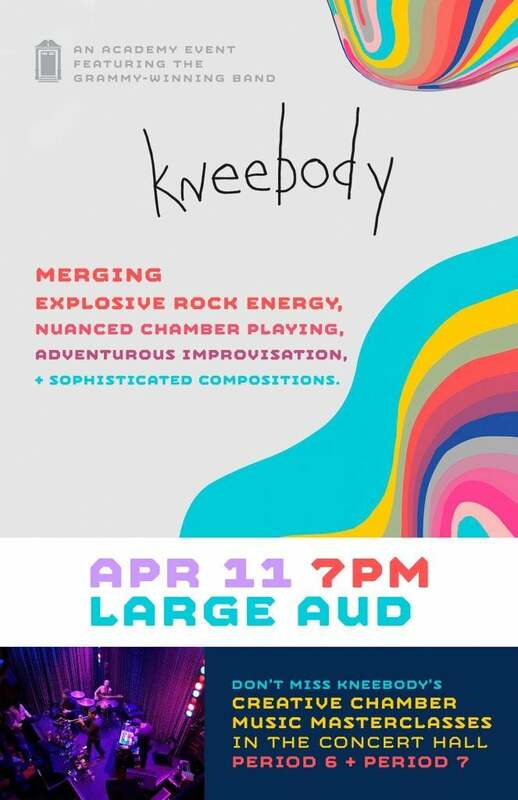 Kneebody is coming to campus this Thursday! There will be masterclasses during Period 6 and 7 in the Concert Hall, and a concert at 7pm in the Large Aud. Kneebody has invented a new genre of music influenced by jazz, chamber music, EDM, pop, punk-rock, and hip-hop. They have released 11 albums, including a Grammy-nominated collaboration with the singer Theo Bleckman. As some of the most seasoned and respected musicians in the industry, the musicians of Kneebody have performed and toured with Snoop Dogg, Prince, George Harrison, Chaka Kahn, Sting, Ani Difranco, and Beck, among others.